Democratic California Gov. Gavin Newsom’s plan to finish the 119-mile stretch of high-speed rail in the Central Valley is expected to cost $10.6 billion, according to official estimates—or $89 million per mile. California voters approved a bond to build the high-speed rail line in 2008. The plan was to connect major urban centers from San Francisco to San Diego on a single line, which was expected to cost $33 billion. Newsom abandoned plans to finish the entire high-speed rail line, instead only committing to complete the Central Valley portion already under construction. State officials reported last year the cost of finishing the Bakersfield-Merced stretch is “now estimated at $10.6 billion,” and the project would be completed in 2022. 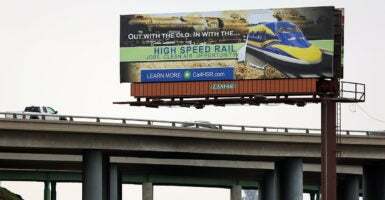 “Abandoning high-speed rail entirely means we will have wasted billions of dollars with nothing but broken promises and lawsuits to show for it,” Newsom said, adding that not finishing the stretch of line would also mean the state would have to repay the federal government. However, finishing that short stretch of high-speed rail line is projected to cost nearly four times what it would take to erect barriers along the U.S.-Mexico border on a per-mile basis. President Donald Trump asked Congress in December for $5 billion to build 215 miles of border wall, which precipitated the longest federal government shutdown in history. On a per-mile basis, the wall would cost $23 million per mile. Congress reached a tentative deal Monday night to give Trump just “$1.375 billion for 55 new miles of fencing in Texas,” according to Bloomberg. If true, the per-mile cost of building 55 miles of border wall would be $25 million. Trump, however, said he was “not happy” with the bipartisan bill, though he did not rule out signing it to avert another government shutdown.